Not content to merely ruin Porsche’s shot at winning the 12 Hours of Sebring, air hoses also ruined one of Martin Truex Jr.’s pit stops during today’s NASCAR Cup Series race. The air hose from Michael McDowell’s car caught the corner of Truex’s wheel well and didn’t want to let go. Truex was blocked in at both sides by other racers in the rush to get in and out of the pits as soon as possible. The No. 17 of Ricky Stenhouse Jr. took a wide path out of his stall behind Truex, so the team was trying to push it out around McDowell’s car in front. That didn’t work so well. 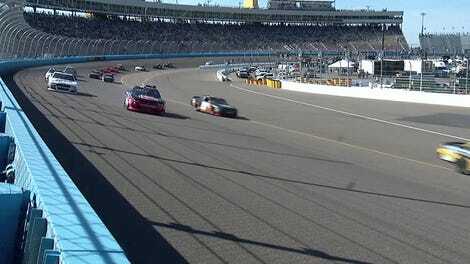 Ryan Newman ultimately won today’s race in overtime at Phoenix Raceway, taking his first Cup Series win since 2013.